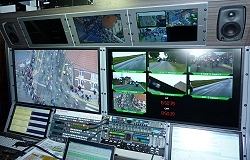 Globecast HD broadcast of the Tour de France 2015. Paris, July 2015: Globecast, the global solutions provider for media, has announced that 2015 has again seen the company contracted to bring one of the world’s great sporting spectacles to screens around the globe: the 2015 Tour de France. From the Grand Départ in Utrecht to the final iconic sprint on the Champs Élysées, Globecast successfully rose to both the technical and logistical challenges posed by this year’s event. The first live broadcast began at 09.30 each day, with the last at 18.45GMT, meaning that Globecast was more often than not the first to set up in the TV compound and the last to leave. Globecast travelled approximately 3,000 km in 21 days with the company’s Special Events team providing the understanding of how to bring such a huge event to the world.